How to use SCAN as a ‘decision-dartboard’ in work-planning? That was probably the highlight in a great conversation outside the IRM-EAC conference in London earlier this week with Kai Schlüter, enterprise-architect at Danish engineering conglomerate Danfoss. Kai heads up a team of about 30 architects who support some 500 software-developers worldwide. As I mentioned in the summary of his talk at the UnicomEA 2013 conference, he takes agile-development almost to extremes: turnround for most fixups in two hours or less, turnround for business-changes often less than a day. By intent, they don’t use a ‘proper’ repository-based EA toolset: instead, their most important EA tools are the whiteboards in every room. But not always – because it can’t always work that way. Which means that they have to decide – fast – what they can do fast, and what they can’t. And that’s where SCAN comes into the picture. 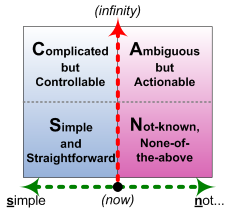 We view the context in terms of two dynamic dimensions – sameness versus difference, and time-distance from the moment of action – which in effect gives us four quadrants: Simple, Complicated, Ambiguous, Not-known. Yes, it looks much like the all-too-typical two-axis frame so beloved by so many consultants, but as you’ll see if you work your way back through some of the various posts here on the SCAN framework, there are a whole lot of subtleties and nuances and overlays and suchlike that, in principle, really ought to be taken into account whenever we use the framework. Me being me, of course, I worry away at all of that detail, finding new layers, new correspondences, new applications. I worry away at getting it right, making it as versatile as possible. Was SCAN designed to work this way, as a simple (some would even say simplistic) categorisation-framework? Definitely not. That’s actually the difference between ‘design-intent’ versus ‘affordance‘: SCAN wasn’t designed to be used in this way, but it affords the possibility of using it that way, in a way that really does work well. So if you know what you’re doing with it, just do it. Kinda simple, really. Despite some inaccuracy in the numbers quite accurate how we use it. 1) we use EPIC SCAN to understand why we are where we are. So very literally the EPIC of how we got where we are. 2) we use WISE SCAN to understand where we want to go. So very literally if it is WISE to go where we thing we should go. 3) we use PACE SCAN to understand at what speed we can change. So very literally what is the PACE to change. gather a group of clever people (Architects in our case) and let them play a variant of Planning Poker till there is agreement on one Architecture Item SCAN value (consensus on S, C, A or N) and then move to the next. Tools we use for it: Whiteboard, Excel and SharePoint (in that order). Likewise thanks for the links to your EPIC SCAN, WISE SCAN and PACE SCAN – all really useful extensions to the original idea. That kind of extension really helps, both in getting the ideas out there, and also in making them more usable for real-world practice.